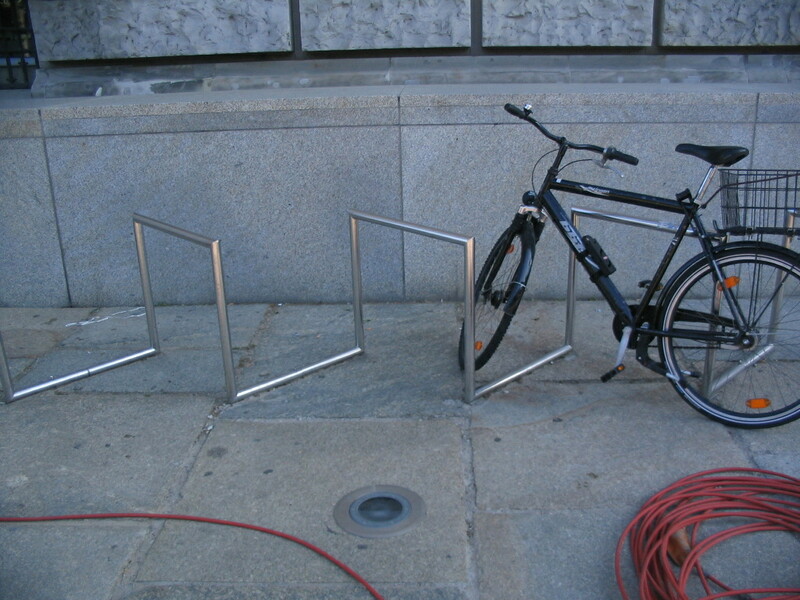 I had the whole morning, over five hours, to explore around Berlin. 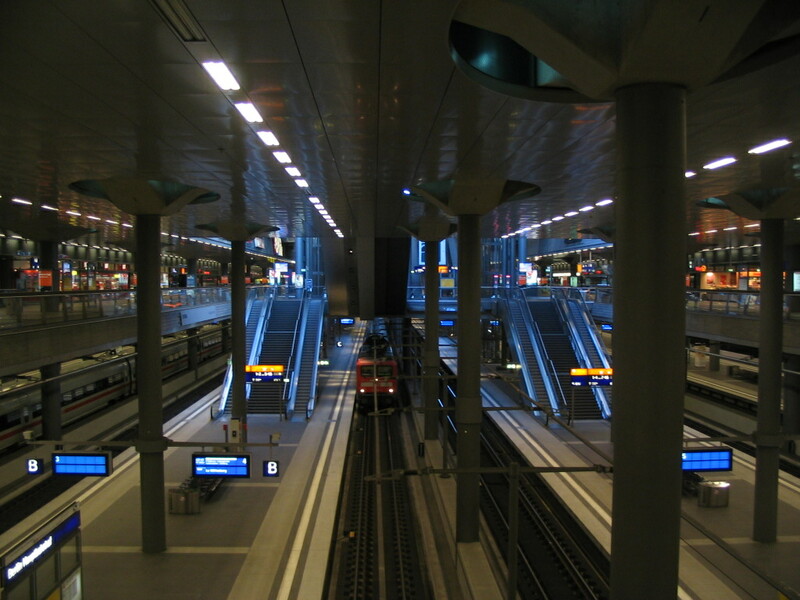 Although I had visited Germany multiple times previously, Berlin was totally new to me. 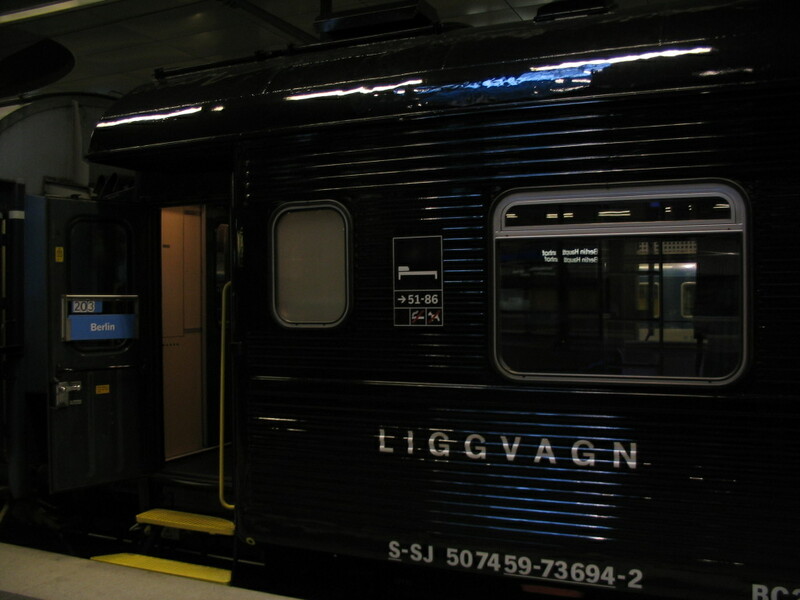 A last look at my classic-looking sleeping car. 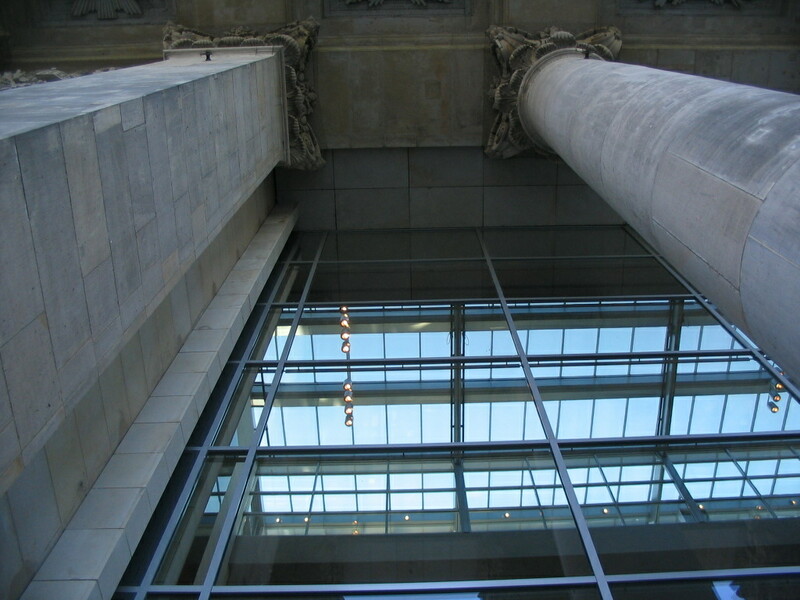 A glimpse way up at the clear daylight. 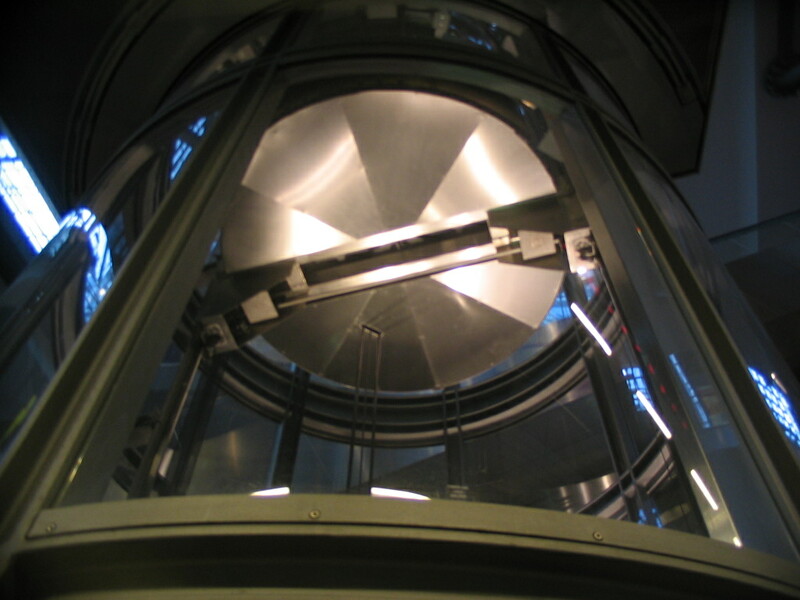 The bottom of the tube-elevator car as it sank down to pick me up. 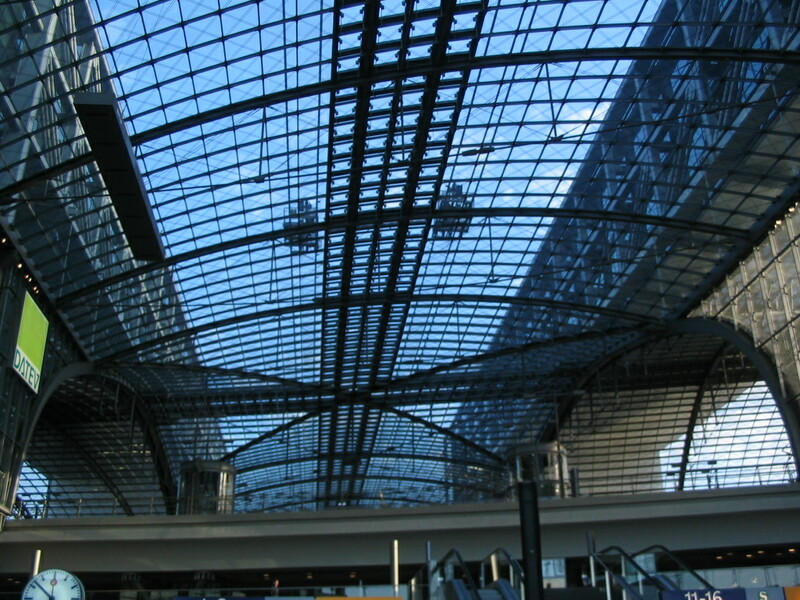 Eventually I got to the top level of the Hauptbahnhof, with its iconic cruciform low-vaulted glass roof. 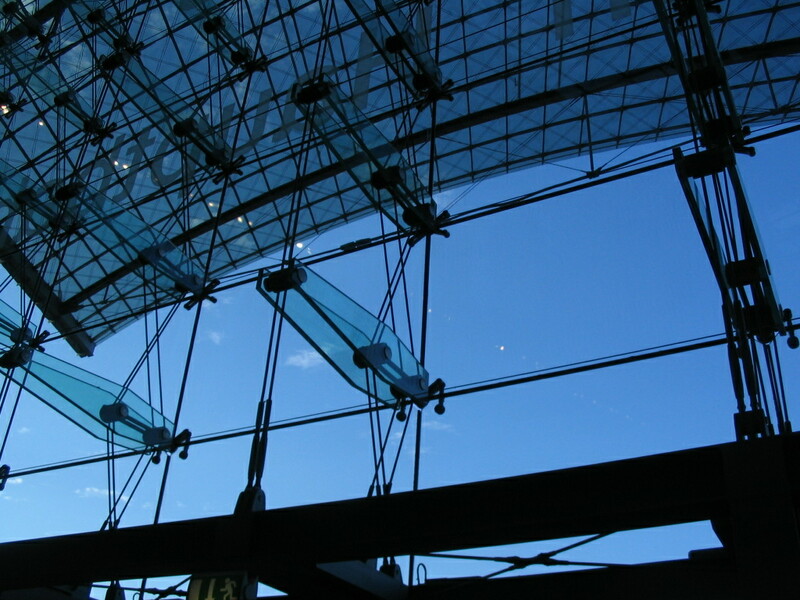 Some pretty sweet glazing support structure. 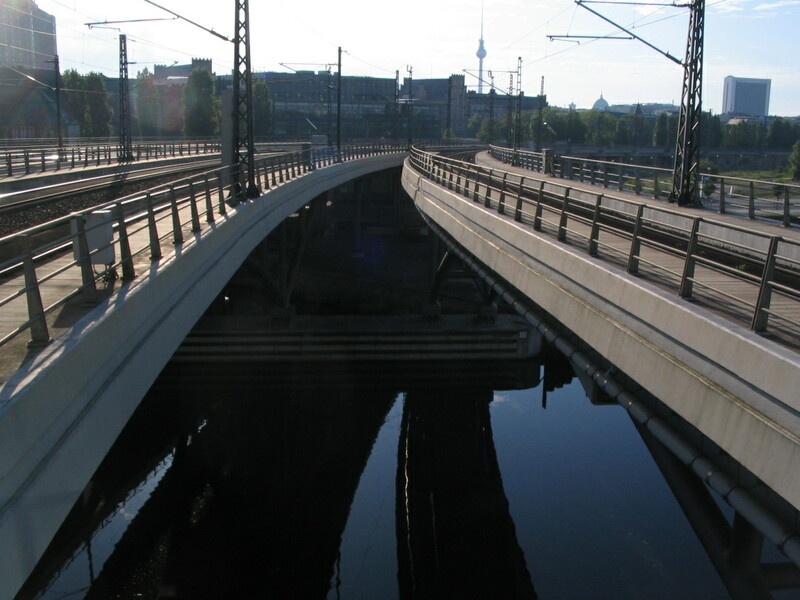 The eastward tracks cross over a canal connected to the nearby River Spree, pretty cool. 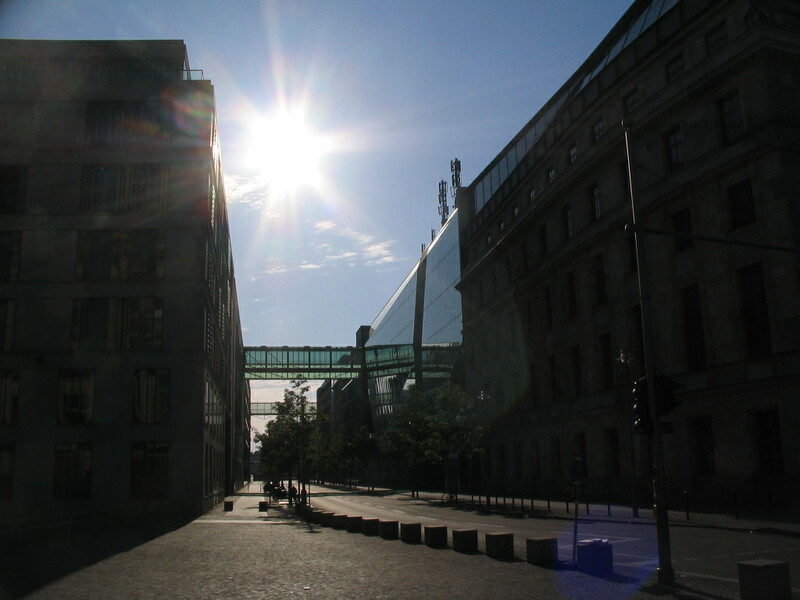 The early-morning-sun-baked eastern façade of the station. Whoa, a real-life speech bubble! 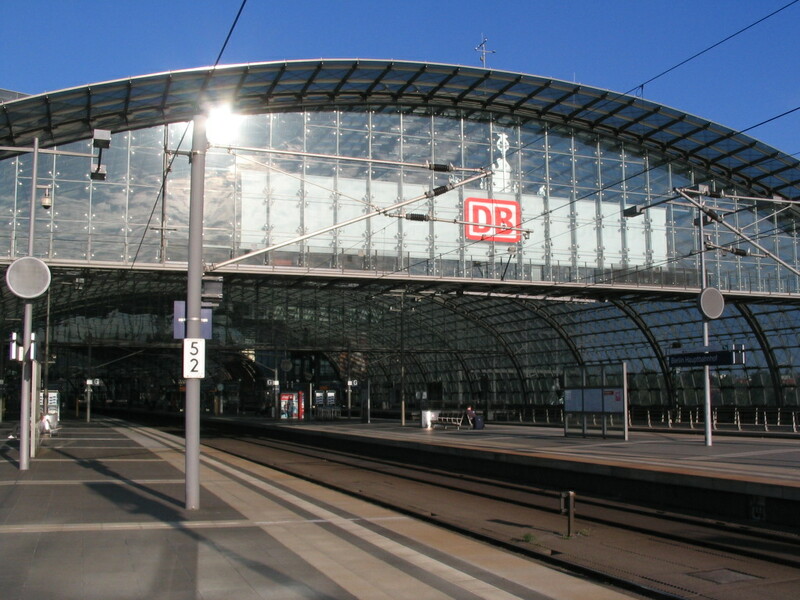 The glassy front entrance to the Hbf. 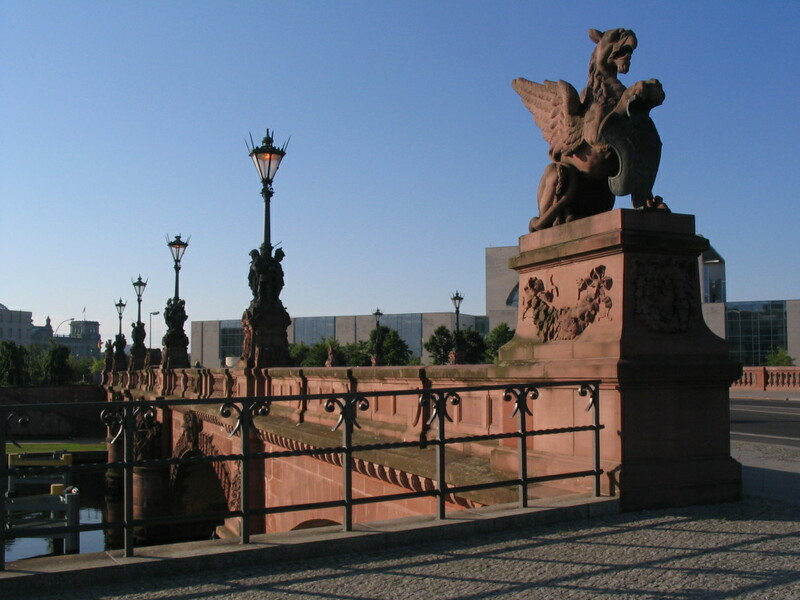 And then a total material contrast in the Moltkebrücke over the Spree. 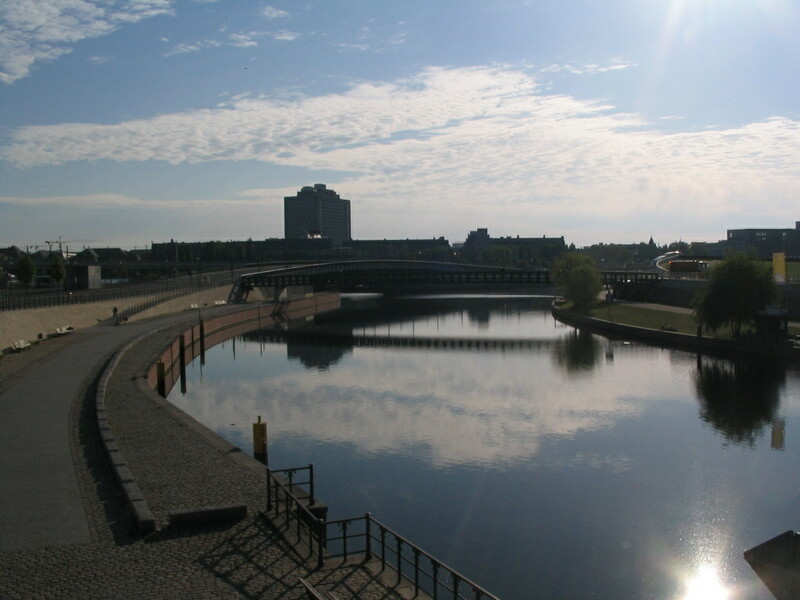 Crossing a grand curve of the river. 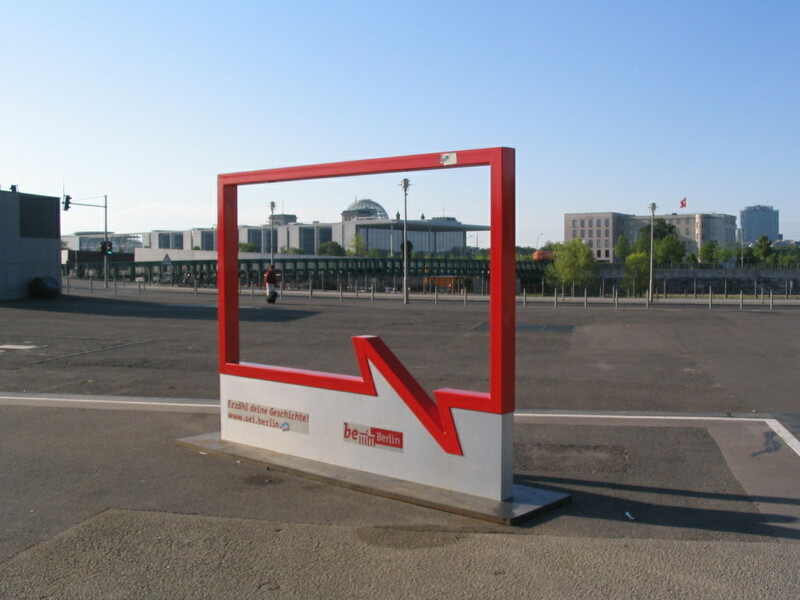 Suddenly I was at the Reichstag! 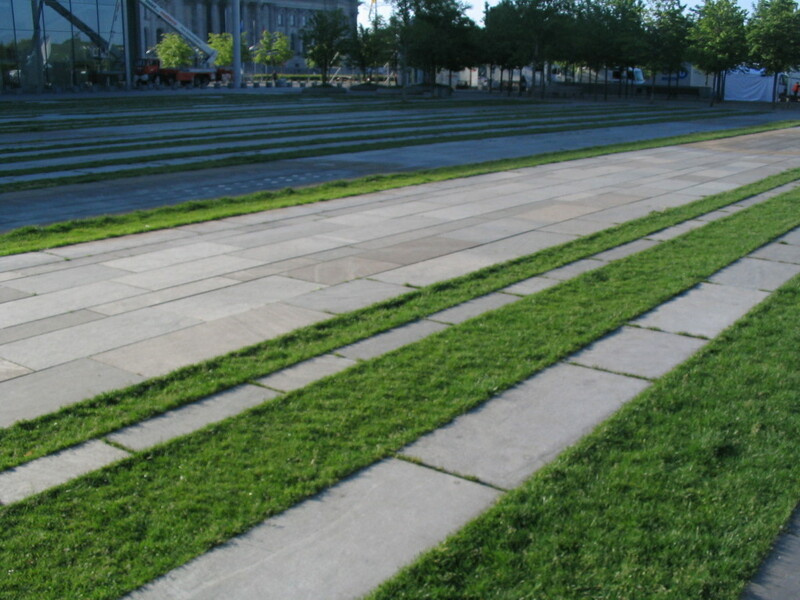 These lawn/stone striations on the grounds are pretty neat. 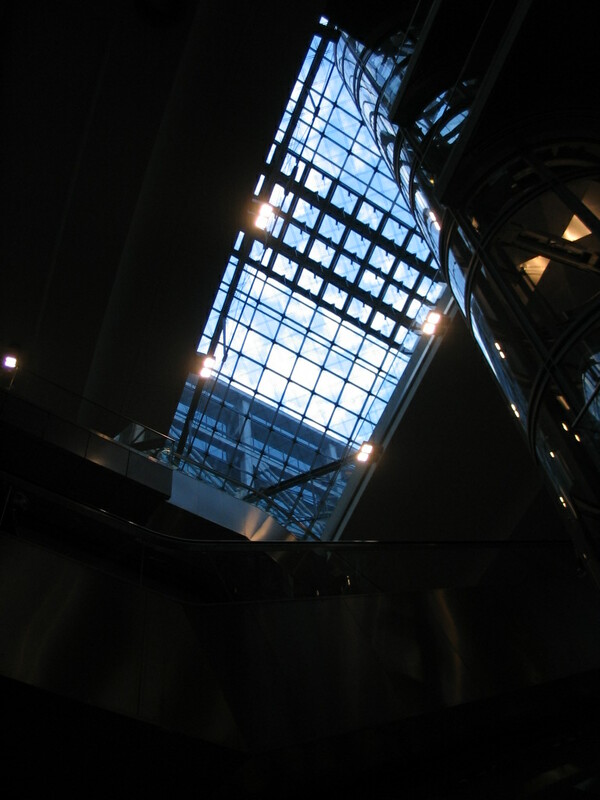 A new day at the Reichstag. 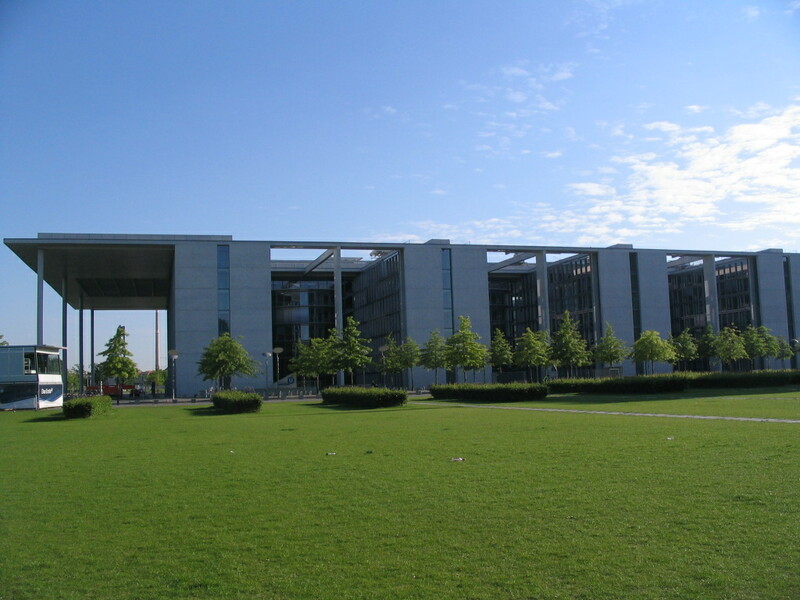 This is the Paul-Löbe-Haus, one of the auxiliary parliamentary offices, lying to the north of the Reichstag. 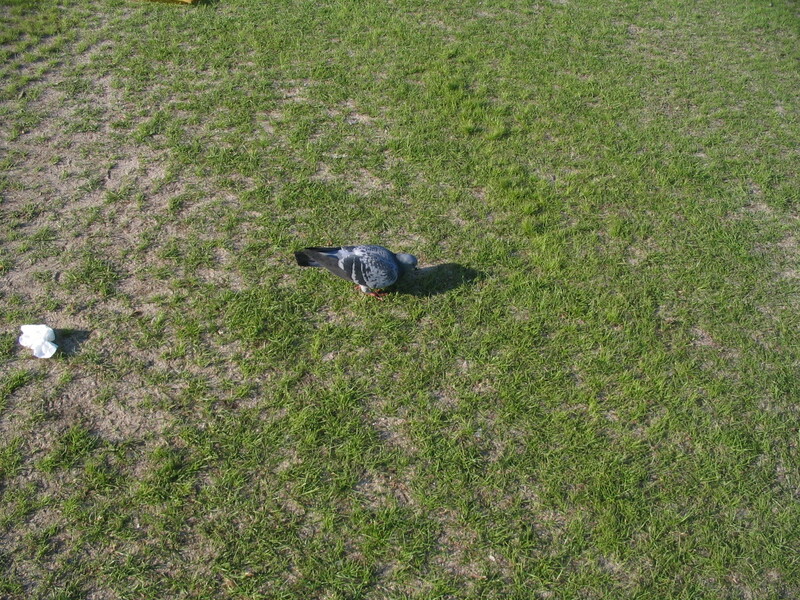 Pigeon punctuation in the midst of a regular grass pattern. 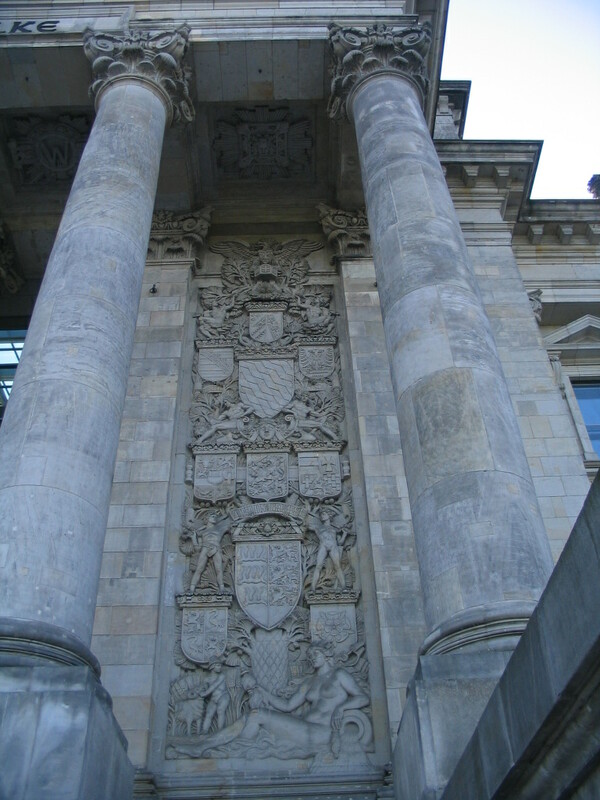 A Bundestag column and pier. 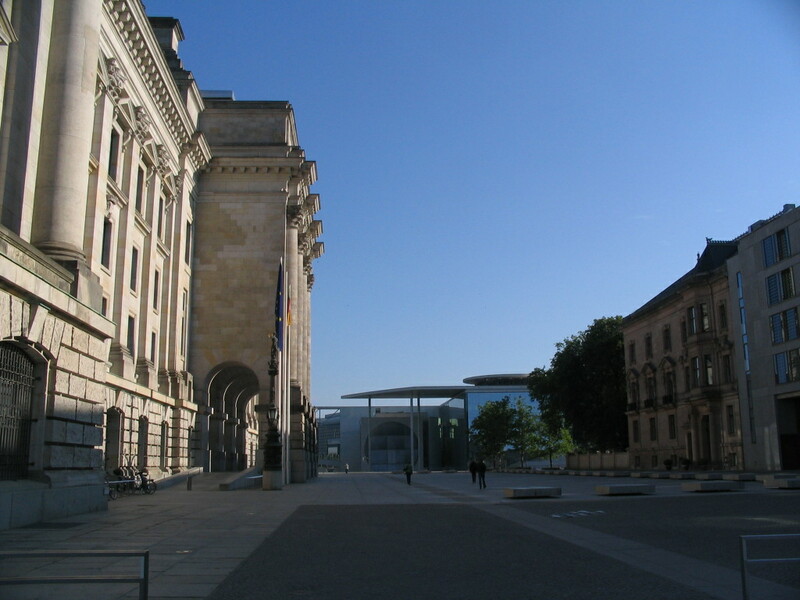 Looking east from the Reichstag along the Dorotheenstraße. 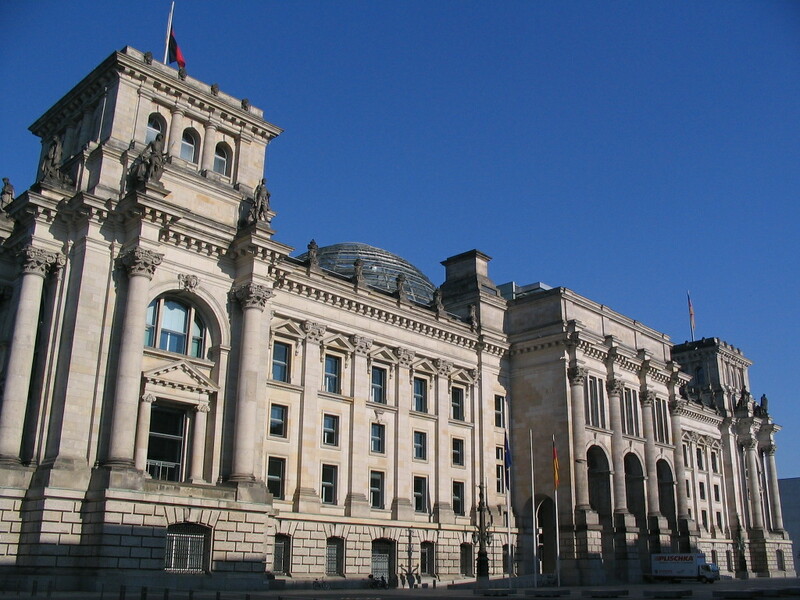 Both sides of the street are the Jacob-Kaiser-Haus, another parliamentary office complex. 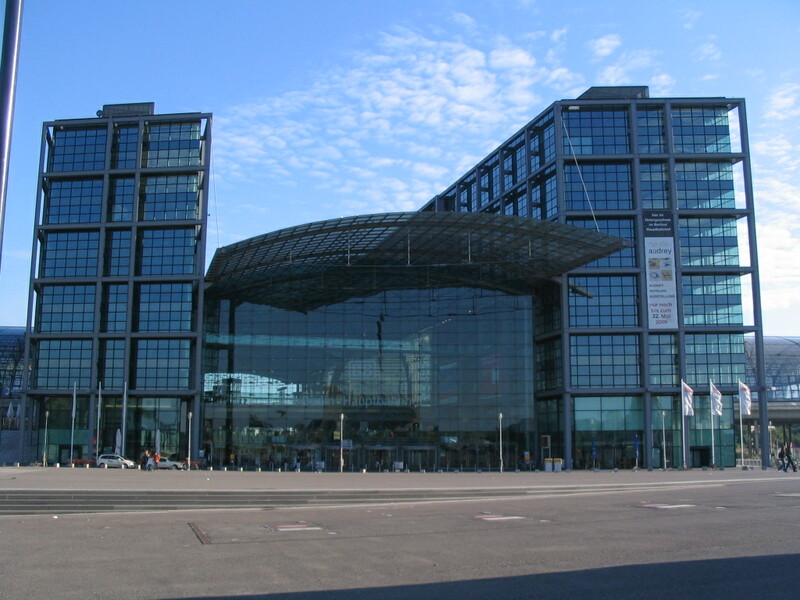 And looking north past the Reichstag to the Marie-Elisabeth-Lüders-Haus, yet another auxiliary parliamentary building, connected to the Paul-Löbe-Haus by a bridge over the Spree. 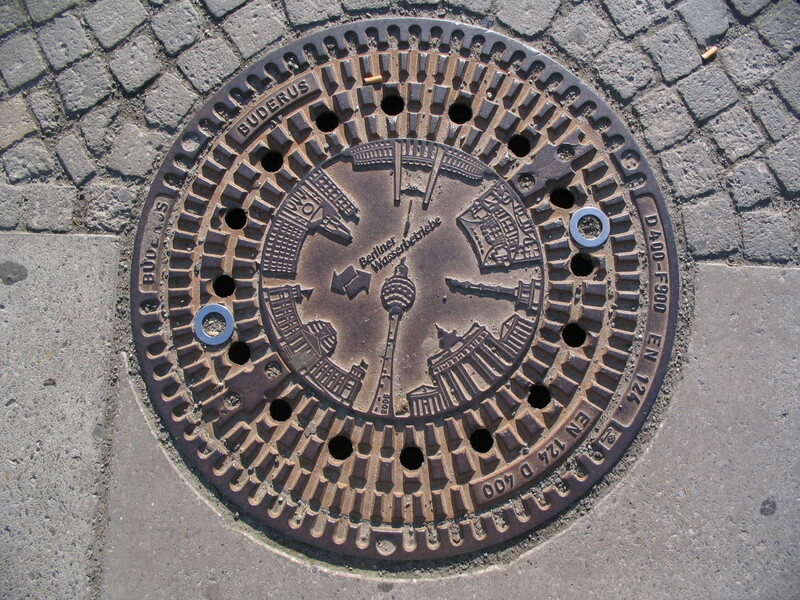 Truly a blue-ribbon manhole cover! 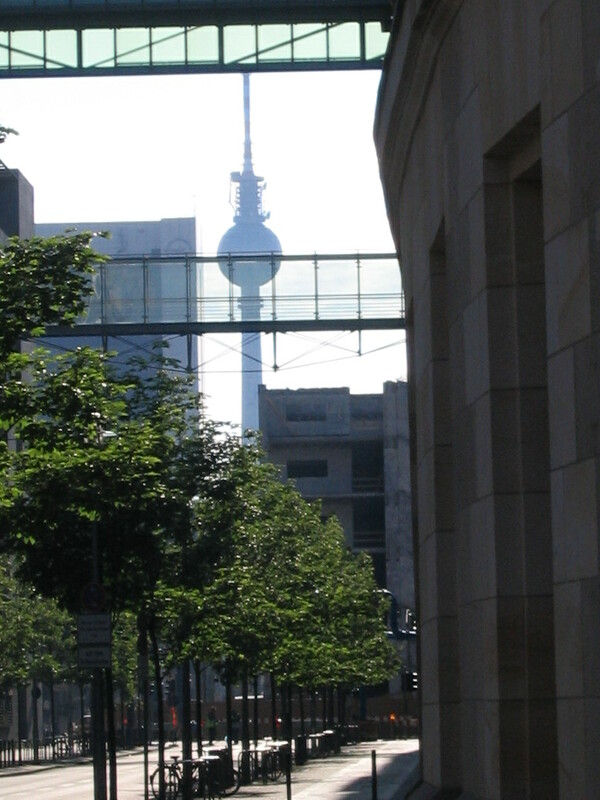 Off in the distance, the unmistakable Fernsehturm (TV Tower). 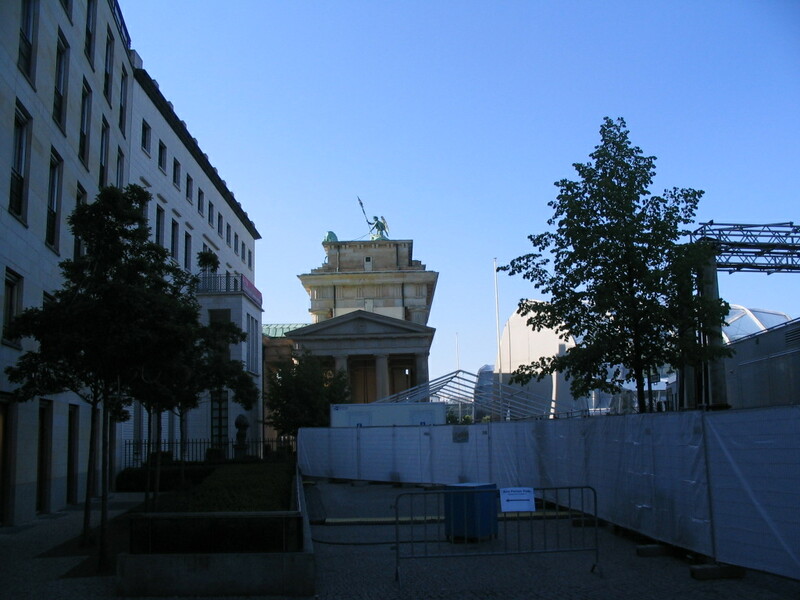 Wait, that's the Brandenburger Tor! Not really ever having studied the layout of Berlin before arriving, I had no idea the Reichstag and the Tor were so close together. 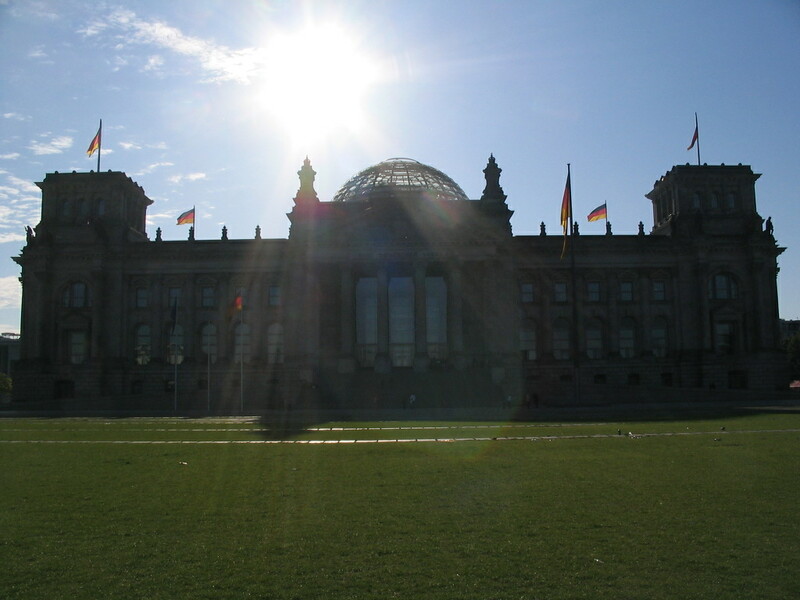 The stark morning sun on the east side of the Reichstag.